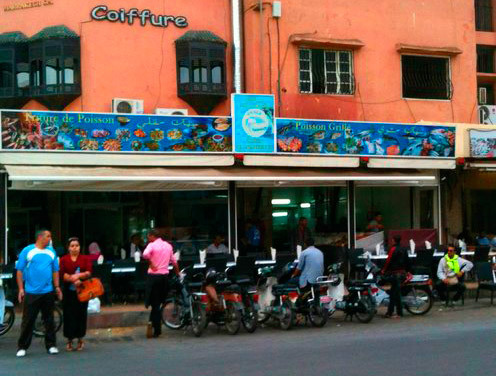 Al Bahriya snack is behind La Poste, close to Zara and McDonald’s is the ideal place to enjoy eating fresh fish. Nearest Maroc Telecom after watching the Grand Cafe de la Poste, you will see a gathering of people seated at long tables enjoying the best fish in Marrakech. It is the prefered place for local people to tast a golden grilled, a lobster or a fried fish sellection ( this IYAdish is called “Special”). “Really good quality seafood for cheap in massive portions. We had the seafood platter with calamaris, prawns, sole, swordfish and salad which came to 70dhs with this you also get 3 sauces bread olives and rice. “I went here at the recommendation of my local host. Walked all the way from the Medina in about 45 minutes. A pleasant evening stroll on a nice and wide sidewalk. They give you bread, Moroccan salad, bell pepper chutney and grilled eggplant free of charge, which is really nice because these can really fill you up. 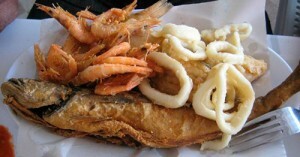 I ordered Friture Al Bahriya, which included shrimps, sole, whiting, and calamari. For 5 EUR, this is the most generous seafood platter anywhere because it’s just pure protein (and a little fat). No vegetables. No filler. Just a heap of seafood on a big plate. I was barely able to finish mine. The shrimps, which were small, had a natural sweet taste. They were crunchy. The squid was very fresh, not a hint of seafood, which was rare because squids can go bad quickly. They were not as crunchy and slightly softy (soggy). The sole was my favorite–the breading was very nice. It’s crunchy on the outside and sweet and flavorful on the inside. The whiting was good and the portion was generous but I didn’t like it as much. My only criticism is that the deep fried seafood platter didn’t come with any sauce, as if the chef wanted you to experience the true taste of the ocean, unadulterated and modified by condiments or sauces. I think they should make the portion smaller.